Phone us on 1300 726 550 to confirm availability and request a formal quotation. You will normally receive the quotation within 10 minutes. 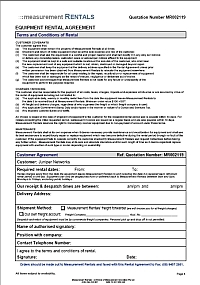 The last page of the quotation is the Rental Agreement that you need to complete and return to us with your purchase order. This will confirm your booking. New customers must pay in advance to confirm the booking.